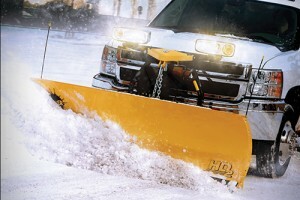 The all-new Fisher® HD2™ straight blade snowplow is constructed of high-strength, powder-coated steel. Ten heavy-gauge steel ribs provide additional structural support and torsional strength under heavy loads. Fisher Engineering’s dual trip-edge protection keeps the blade upright and plowed snow in front of the blade. A standard 1/2-in. steel cutting edge (3/8 in. on 7 ft. 6 in. model) can be replaced with optional cutting edges including rubber, poly, 5/8-in. steel and carbide. The Fisher HD2 snowplow has a 29in. blade height and comes in four sizes ranging from 7 ft. 6 in. to 9 ft.